We will be glad to do that, assuming that these are to be planted in late July and bloom in September, October, November and December. We don't know if there is a specific occasion you are planning for, but we are frequently asked similar questions for the purpose of making a background for weddings, so we would like for you to read some previous Mr. Smarty Plants answers on that subject for background information (we are a little lazy, and this avoids retyping). September wedding - please follow all of the links in this answer for more of the same. Now, if you have read all that, we assume that you realize that you can't get there from here. In Texas and other warm climates, seeds for annual flowers are planted in the Fall to come up and bloom the next Spring. Seeds for biennial or perennial plants will be planted in the Fall, come up in the Spring of the next year, and bloom the year after. 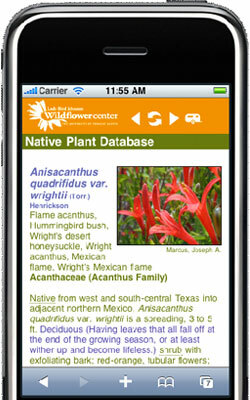 What we can do is make you a list of flowers native to South Texas, using our Recommended Species for South Texas List. Using the sidebar on the right hand side of that page, we will select "herb" (herbaceous blooming plants) that will bloom in those four months. August 02, 2011 - Looking to plant desert willow as shrub. Any helpful tips to keep height down and plant full or bushy. Can Habiturf be planted by hydroseeding from Austin? February 04, 2012 - We are thinking about seeding our lawn with HABITURF. Could you provide any input on whether HABITURF can be planted by hydroseeding? Thanks! Will suckering of coralberry be a problem in Homewood AL?